Guests included the spouses of Marie Kuipers, Robert Mardirossian, Sam Badger, John Thomas, Barb Tubekis, Patti Van Cleave and Peter Skalski. 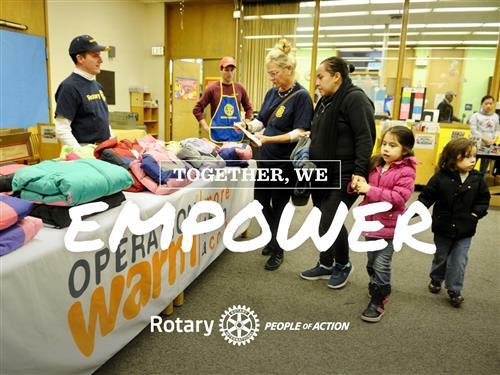 Other guests were Jessica Tucker and Creed Tucker (guests of Bob Baker), Kelly Lange (Joe Nash guest), John Zeddies (Peter Skalski guest), Kate Hughes (representing School District 36), Alan Ramson and Mary Bak (Rotary Asst. District Governor). Bob Baker dedicated the thought of the day to our new President, Patti Van Cleave, which extolled the virtues of “keeping things simple”. It was announced that Mark Kotz has had some health problems and is hospitalized at Glenbrook Hospital. A card was passed for all to offer their good wishes for a quick recovery. Outgoing President John Thomas expressed his appreciation for the opportunity to be the Club’s President for the last year. He expressly mentioned the help he received from Mark Kotz, Rodger Morris, Rich Lalley and the 15 Board members serving during his term. He mentioned that he would now be able to “finish his lunch” at our regular meetings rather than starting the meetings promptly at 12:15. 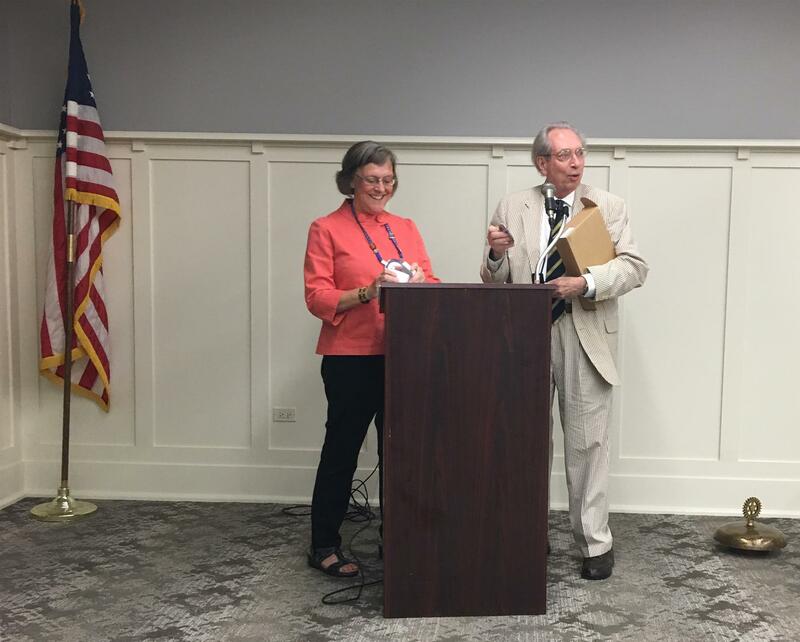 Patti Van Cleave presented John with a Rotary plaque and a Past President pin and badge in recognition of all John’s good efforts in leading the group over the last year. Tony Kambich and Rodger Morris then presented John with a special Paul Harris award in recognition of John becoming a Paul Harris Fellow and for his substantial contribution in furthering Rotary’s goals and programs during his time as President. 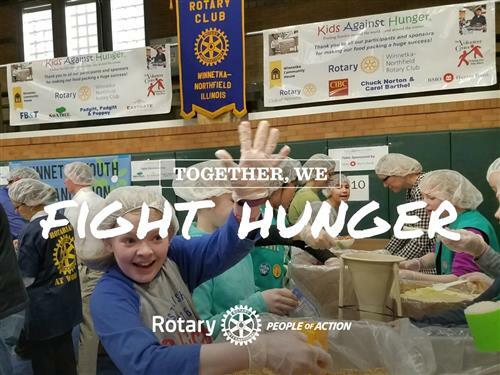 Mary Bak, our Assistant District Governor, then complimented our Club on a couple of accomplishments that stood out to her—our Kids Against Hunger program and the fact that our Club’s annual giving to the Rotary Foundation exceeded substantially our annual goal. 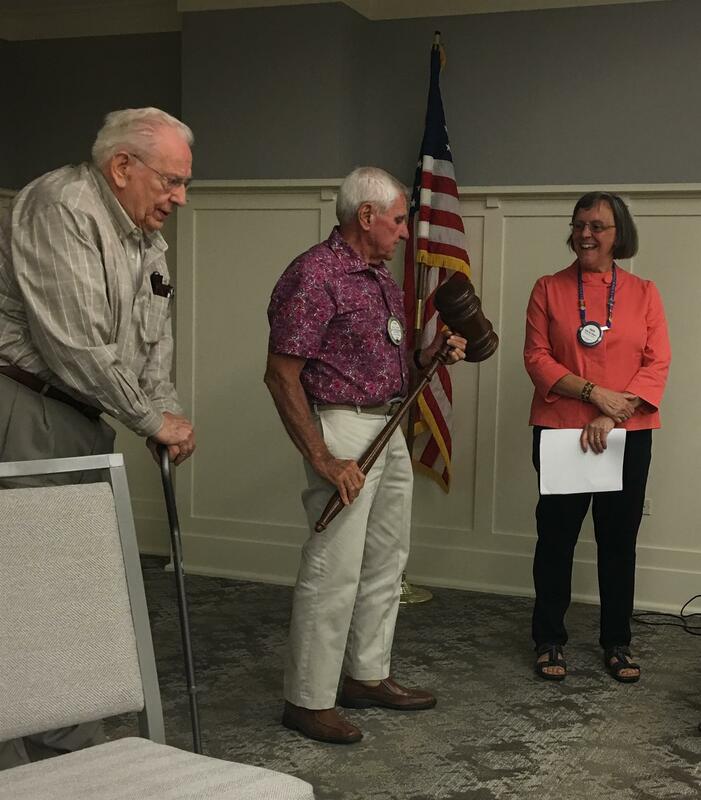 Mary then proceeded to swear in our new Club President, Patti Van Cleave, as well as the 15-member Board for next year. Patti gave a short acceptance speech pointing out the long and accomplished history of our Rotary Club which started back in 1911; that the Club’s main function was for fellowship and an opportunity to serve others; that our Club needs more publicity for the good things it does, including such things as its efforts to eradicate polio, Operation Warm, Kids Against Hunger, and the community grants program. Among her goals for next year are to engage current members in “service before self”; tell stories of those people/organizations we serve; and to collaborate with others to make things better for those in need. With both our past President and new President receiving applause for jobs well done, the meeting was adjourned.